The Quad-Flex Power Pack is an amazing 3-in-1 kit, which can used as Quad-Flex RDA, Quad-Flex Squonker (bottom-eeed) RDA and RDTA atomizer. It comes with 22mm diameter and 510 thread, which is compatible with most 510 threading batteries. The Quad-Flex Power Pack is an amazing 3-in-1 kit, which can be used as Quad-Flex RDA, Quad-Flex Squonker (bottom-need) RDA and RDTA atomizer. 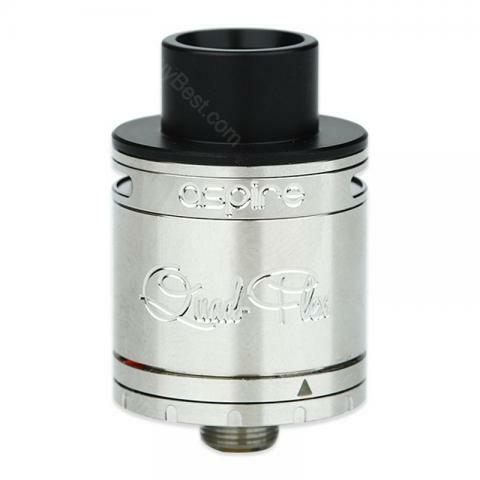 To configure RDTA, you need to use the Quad-Power RDTA adapter. It comes with 22mm diameter and 510 thread, which is compatible with most 510 threading batteries. The Stainless Steel & Pyrex glass appearance make it more attractive. 2 colors in stock! • It's compatible with most 510 threading batteries. • It's an empty cartomizer, you still need order e-juice/e-liquid to use it. • To turn the Quad-Flex Power Pack to RDTA, you must have a Nautilus X.
Ich muss sagen mir gefällt Eleaf ASTER TC MOD sehr gut alles war gut verpackt und sie macht echt spass zu rauchen. As an Aspire fan, I like Quad-flex very much.